(Nanowerk News) Photochromes are dyes that change their colour depending on the light they receive. When light is switched off they can either remain in their photoinduced state (P-type photochromes) or turn back to their original state (T-type photochromes). 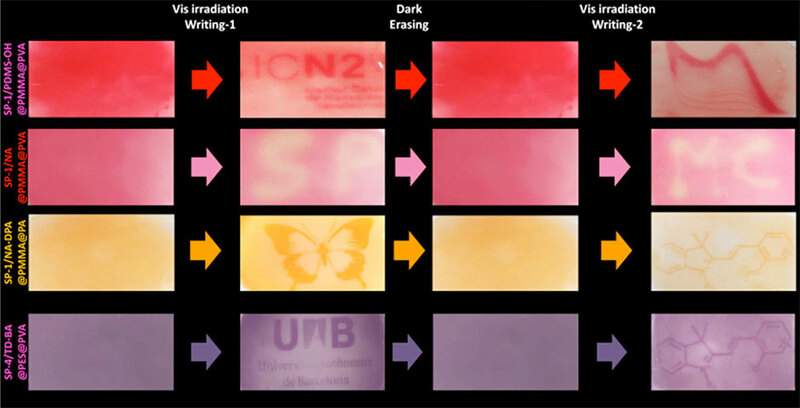 The last ones may colour when irradiated, bleaching when light is moved away (direct photochromism) or discolour under irradiation, getting back their colour in the dark (reverse photochromism). A new, straightforward, reactions-free and universal strategy to obtain solid materials with highly tuneable reverse photochromism has been recently developed from a collaboration between the ICN2 and the Department of Chemistry of the UAB, and published in ACS Applied Materials & Interfaces ("Solid Materials with Tunable Reverse Photochromism"). The last author of the article and leader of the research is Dr Claudio Roscini, who supervised the work of the PhD student Àlex Julià, both from the ICN2 Nanostructured Functional Materials Group, led by Dr Daniel Ruiz. The author from the Chemistry Department of the UAB is Dr Jordi Hernando. These researchers employed commercially available organic compounds from the family of spiropyran, which can be stabilized to different states with different colours and colouration rates by simply varying the nature of the surrounding media (functional phase-change-material).